Not sure why Doug is giving the camera his ca-razy eyes! Or why my neighbor has decided to trash my alley picture taking spot! Haha - love the last photo of you and Doug. Wow. So cuttteeeee! Loving that second to last photo. It's sooo cute. You look so awesome! 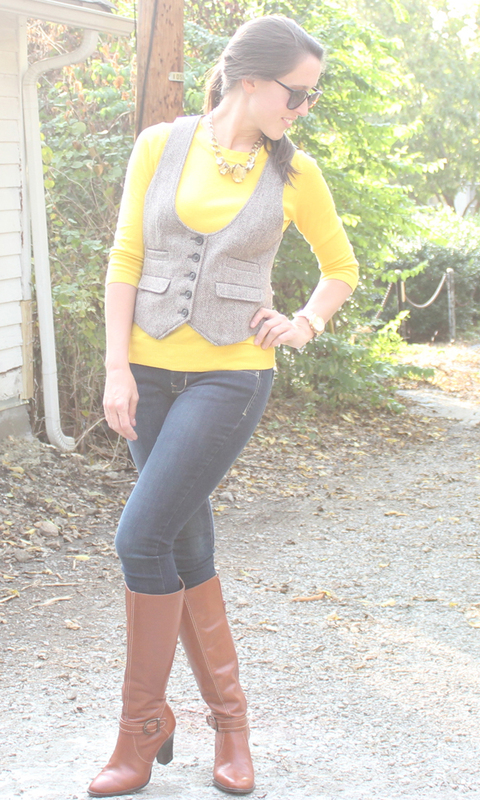 I LOVE that vest over the yellow shirt and those boots are gorgeous!! Bummer, that sounds like such a fun date too! I love this "equestrian" look though, even if you didn't get to do any riding! adorable outfit. Sorry you didn't get to go horseback riding. The weather in Nashville has been so weird/stormy/humid! Sorry that your date got canceled, but good for you for wearing your riding outfit anyway :) I got to check off a few more fall activities this weekend so that was a success! I LOVE this outfit... Probably the best you ever pulled together... Those boots are amazing! I would wear this in a heartbeat (except maybe a different color sweater since I look awful in yellow!). 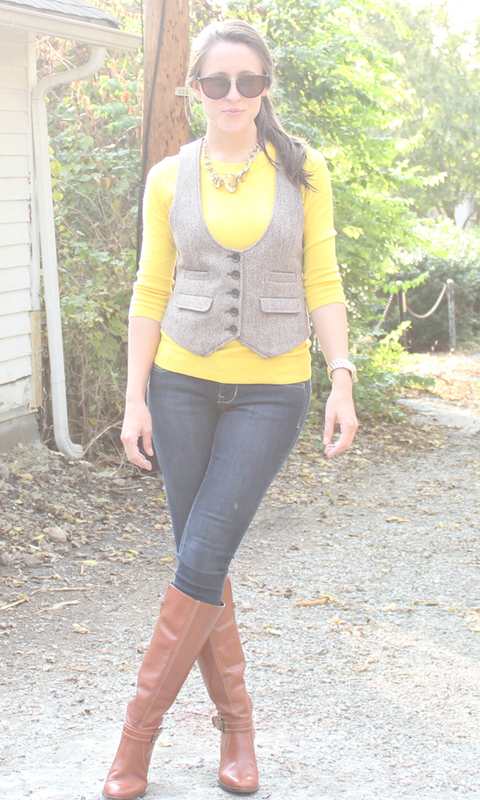 I totally love anything equestrian looking or tailored menswear, and you've mixed both! SO cute! 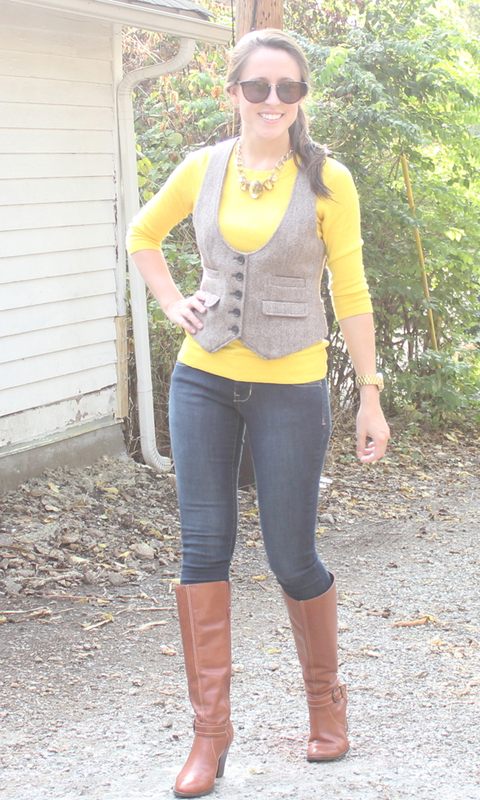 That vest is super flattering on you, great choice! Thank you - looking forward to when we do get to head out into the country on some horses! Aw, thanks lady! These $20 Old Navy jeans are doing me some favors! oh i LOVE this chic equestrian look! and doug is HILARIOUS. love him! I am obsessed lady! Thanks again! Yup, this is an old school beaut from college! 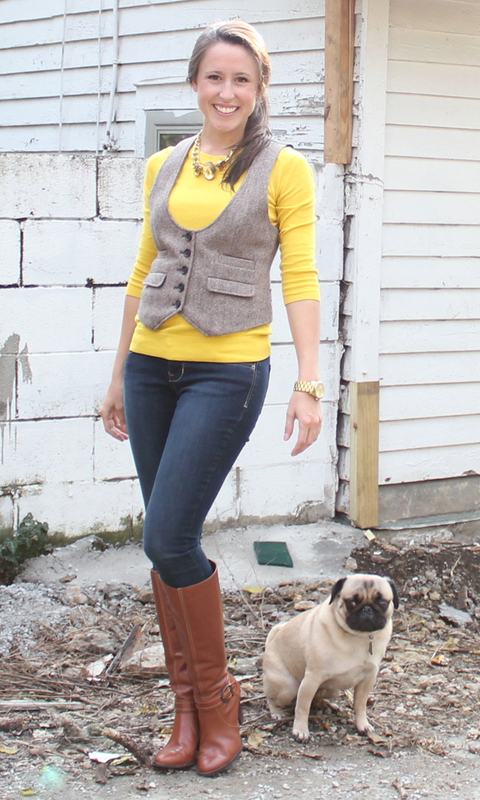 awkward & awesome: "katniss with a pug face"